WayRay, a Swiss augmented reality technology provider, brought its in-car heads-up display solutions to CES 2018 to show what its unique approach can do. 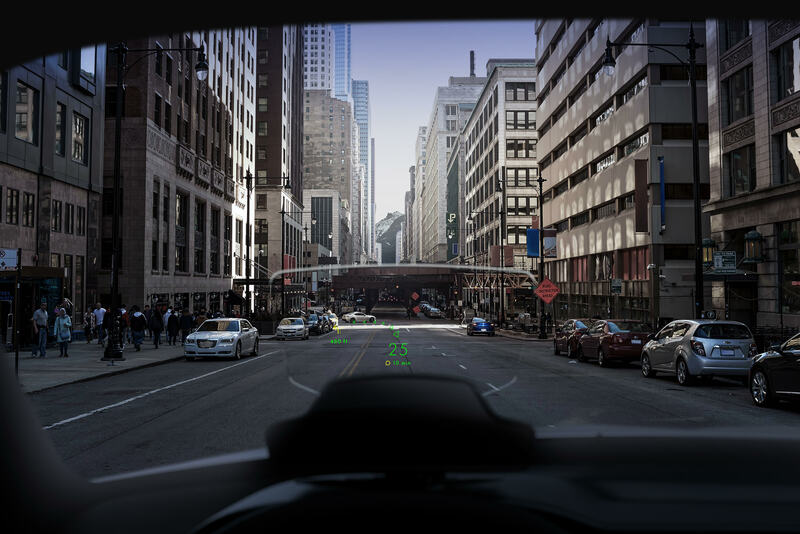 The company was showing off its NAVION aftermarket solution to the public for the first time, and also had its holographic AR in-windshield product, designed for OEMs, available for anyone to try. I tried it myself and was impressed by the results. The display is clear and easy to read, both in the solution that’s designed to be built directly into windshields by automaker OEMs and in the aftermarket device. The aftermarket version was using a simple two-color overlay, in both red and green, but the company’s CEO Vitaly Ponomarev told me that it’ll soon be introducing blue, too. Even with just two colors, it was very easy to identify all the crucial information shown by the system. Part of the reason why WayRay’s tech is so good compared to the average in-car HUD is that it has a wider field of view than most. A driver can see it from 11 degrees of range in the built-in solution, which is much better than the 8 degrees that you typically get from automotive HUDs. The aftermarket version, which uses its own display, has less simulated depth and also offers only 8 degrees of field of view, but it’s still far better at making its seem like the information it projects is actually “stuck” to the road. This is something that’s unique to the way WayRay manages its simultaneous localization and mapping (SLAM) technology. The product can combine data, including location and mapping information, along with vision data gathered by the front-facing camera, to more effectively place its visualizations on the real world in front of the car. Compared to other automaker OEM products I’ve used, and to other aftermarket devices like the Navdy, WayRay’s system felt a lot better, and a lot more authentically tied to what you’re actually seeing as a driver. Ponomarev told me that’s why they term their product “True AR,” in order to differentiate it from the less effective methods that fudge the effect from insufficient information. WayRay is already in talks with OEMs to incorporate its technology into windscreens for future vehicles, including China’s SAIC, Honda and other manufacturers it wasn’t yet at liberty to discuss. The company also plans to ship its aftermarket solution sometime later this year. Also at CES, WayRay demonstrated its True AR SDK, which is a development platform it created to allow others to build AR apps for automobiles. These could include software that shows points of interest, enhances navigation, offers deals on purchases and more. Ponomarev told me they then plan to launch an app store for their product. It also says it intends to own the branding for this store, even if OEMs choose to incorporate it in their own vehicles along with the AR HUD hardware. WayRay has already raised $30 million, and it’s opening a new office in Silicon Valley, with the HQ still based in Lausanne, Switzerland. Ponomarev told me they’re also currently raising a $50 million round, though he couldn’t disclose any of the investors participating as it’s not yet closed.